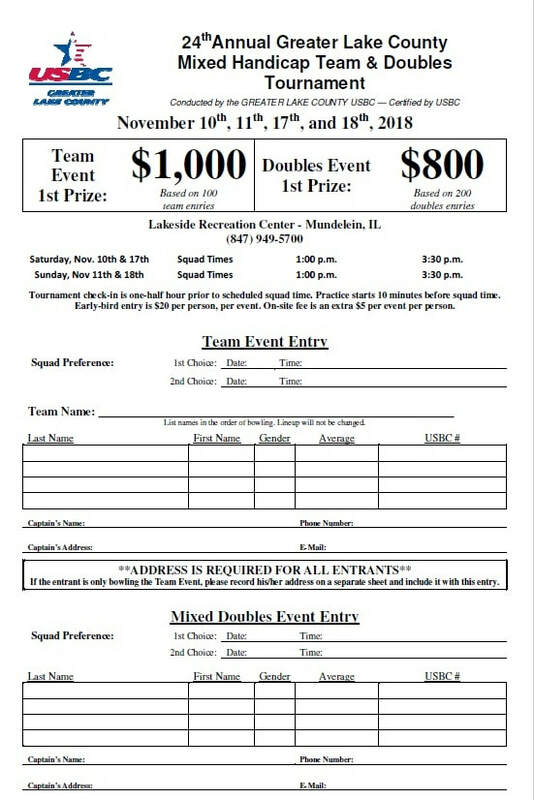 Lakeside Recreation Center will host the 24th Annual Greater Lake County Mixed Handicap Team and Doubles Tournament. Event dates are November 10th, 11th, 17th, and 18th 2018 with squad times of 1:00 pm and 3:30 pm each day. The early-bird entry fee for this event is $20.00 per bowler, per event and entries close November 18, 2018. We are anticipating a lot of interest in this year's event so early entry is encouraged to secure your squad dates and time! A copy of this event entry form can be downloaded from the GLCUSBC website and will be made available in your local bowling centers.